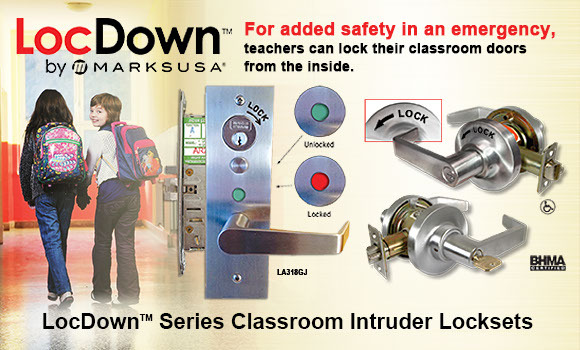 To answer the challenge of security and life safety in today’s classroom environment, MARKS USA Custom Lockset Division has developed the LocDown™ Classroom Intruder ANSI/BHMA F110 Function Leverset with Clutch Design (MARKS USA Function DB). MARKS USA has incorporated all of the standard features of their Survivor Series Locksets (Clutch System, Super Strength Retractor, Long Life Lever Support Springs and a Life Test of over 3 Million Cycles) with their new Life Safety Classroom Intruder Function. At the first sign of trouble outside; lock down a classroom instantly with MARKS USA’s LocDown™ Classroom Intruder Locksets. Classroom function cylindrical (F110 function) and mortise (LA318GJ) locksets are designed to be locked or unlocked from the exterior with the interior always in an open position, but allows in emergency life safety situations the teacher to secure the classroom without stepping into the hallway to lock the outside handle. Faculty & students remain safely within the classroom. 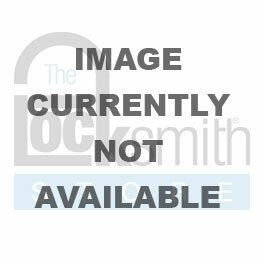 There is no need to open the door, the exterior lever is disabled by operating the interior lock cylinder. Everyone involved in schools, from parents, students and teachers to administrators and facility managers, are actively looking for expert solutions and actionable steps to secure their K-12 or college/university. And, you can be that expert provider. Better access control is one of the best steps you can offer and they can truly use today – right now. SAVI™, the Security Access-Control Vulnerability Index™ is what we created for security professionals to use as an objective, brand agnostic audit tool to valuate any school’s access control vulnerability.